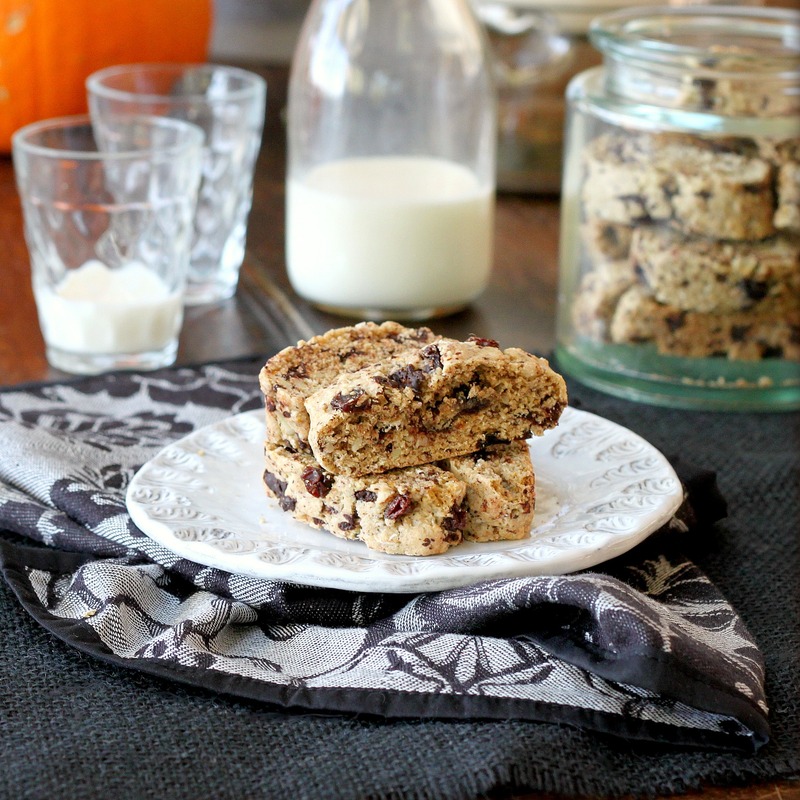 Biscotti are a twice-baked crisp Italian cookie, famously crunchy and perfect for dipping in coffee or milk. Many variations exist, including the traditional anise or almond biscotti, as well as cocoa infused chocolate biscotti. In this recipe I threw in everything I like in a cookie: chocolate, raisins, toasted almonds and orange zest. It sounds like a busy list of ingredients, but the resulting cookie was delightfully simple and not overly sweet. I added raisins to the biscotti as an afterthought for a little sweetness and texture; they may be omitted if you prefer a drier biscotti. I recommend using golden raisins for their color and flavor if you can find them. Preheat oven to 350 F. Line a large baking sheet with parchment paper. Combine the flour, sugar, cinnamon, baking powder and salt in a bowl of an electric mixer. Mix briefly to combine. Whisk eggs, oil, orange liqueur, vanilla and zest together in a separate bowl. Add the wet ingredients to the flour. Beat on medium speed until combined, 1 minute. Stir in chocolate, raisins and almonds. Divide dough in half. Transfer to baking sheet and shape each half into a log the length of the baking sheet. Flatten each log into a 2 inch wide strip. Bake until firm and beginning to color, about 30 minutes. Remove from oven and cool 15 minutes. Reduce oven to 300 F. (150 C.) Transfer biscotti to a cutting board. Cut in 3/4 inch strips with a serrated knife. Arrange cut side down on baking sheet. Bake until they are lightly golden, about 20 minutes, turning them halfway through cooking. Remove from oven and cool completely on racks. Store in an airtight container for up to a week. Lovely biscotti! This flavor combination is wonderfully festive. 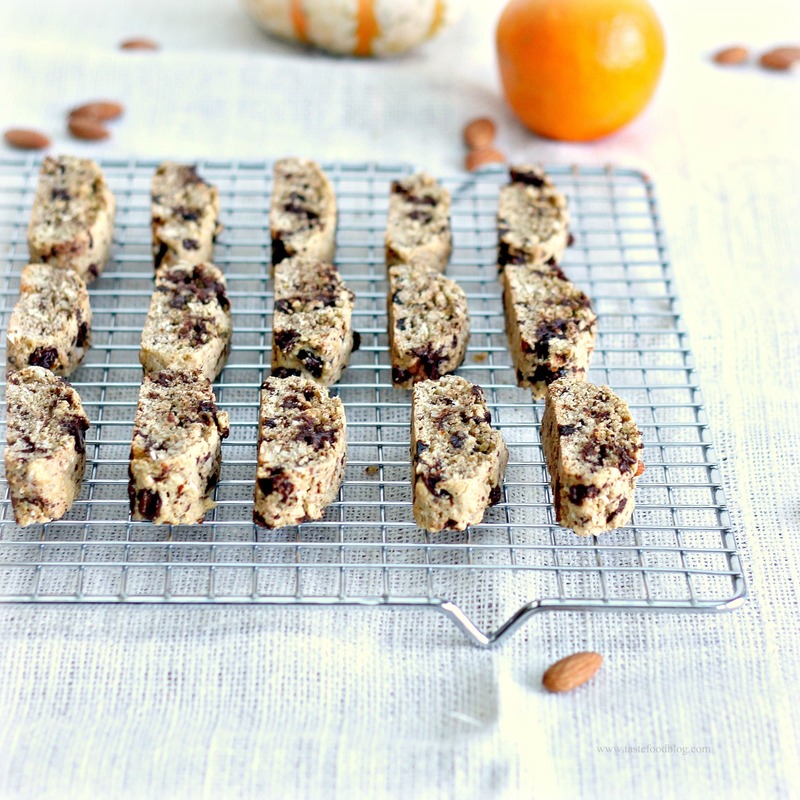 I make a similar biscotti without the nuts that I just love, but I’ve not included the orange. That will be a great addition the next time I make these! Thanks for the idea! I love the addition of Grand Marnier. What a great cookie! I have got to get on this biscotti thing. I have yet to make them, but they looks so fabulous. I’m not a big chocolate fan, but I’m sure I can make a twist on this. They just look so good! Orange and chocolate are such a wonderful combo. I bet these would be soooo good dunked in a latté. Perfect weather for this type of afternoon snack too. I like the wonderful combination of flavors.. I love that you added the raisins to these gorgeous treats, I like a little chew in my biscotti. This is a great recipe! I really like how you have just added everything you like to the mix. Thanks for the great recipe! Even though I had to tweak a bit based on the ingredients I had on hand, they were a big hit with my family and co-workers. I will definitely make these again!